Greetings Fellow Scouters/Unit Troop and Venture unit leaders. 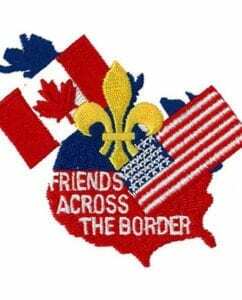 The 36th Annual Hands Across the Border will be held in Canada at Camp Stone, near Kimberley British Columbia, September 29-Oct 1, 2017. The event organizer is long time Scout Canada Scouter and friend of the Montana Council, Lamont Luscher. This is the first time in several years the event will be held in Canada. This is very exciting news and I believe those units going will have a great experience. I am currently part of the Council International Committee. I will be coordinating the MT Council participation in the event, and I plan to attend, as well. To give you an idea, the camp’s location is a 5-hour drive from Missoula, not taking into account border crossing time. I know September 2017 seems like a long time from now, but going to Canada will present certain requirements that we need our units and scouts attending to take care of in time. As you are all aware, in order to cross into Canada, you will need either a valid passport or a passport card. The passport card is the cheaper option and it requires the parents of the scout going to apply for one for their scout. If the scout or scouter already has a regular passport, also known as a passport book, which will not expire during this time, they are good to go. If not, a passport card is the most economical way to go, only $30.00 versus $100 + for a regular passport. Parental permission form that allows the Troop leader to take the scout across into Canada. I will be working on a form that everyone can use. BSA Medical Form A and b, and possibly C if you will take 72 hours or more, all depends on when you plan to leave on Sept 30 and when you are coming back on Oct 1st. Citizenship in the World merit badge: Requirements 7 c and e could be accomplished at this event if the scout is working on this merit badge. I will be sending updates as they become available. Please, if you think your unit is planning on attending, let me know as soon as possible. I don’t need numbers until we get closer to the event but it will be nice to know how many units are planning on going. You can reach me at thiguera@aol.com, or 406-552-3404.